“WE HAVE TO PROTECT ISRAEL,” said Trump when asked—”When are our troops coming home from Syria?”—by Face The Nation on Sunday. 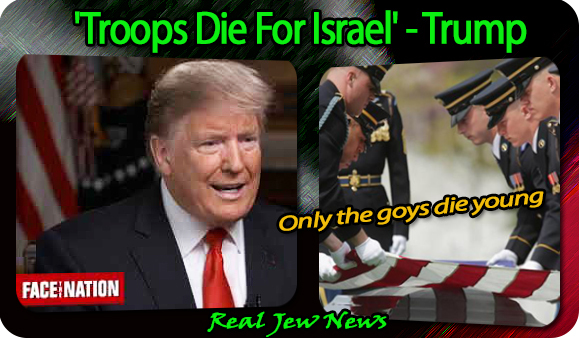 ‘Our troops in Syria have been dying for Israel and continue to die’…as in the recent terror bombing that killed 4 troops and injured 3 on January 16 2019. That was the first thing he blurted out after originally declaring that the troops in Syria would come home in 30 days, then coming home soon, then in an orderly drawn out withdrawal, then redeployed to Iraq, and on and on. He said it then, he lied, he’s out with it, they’re staying, so Trump owns it. 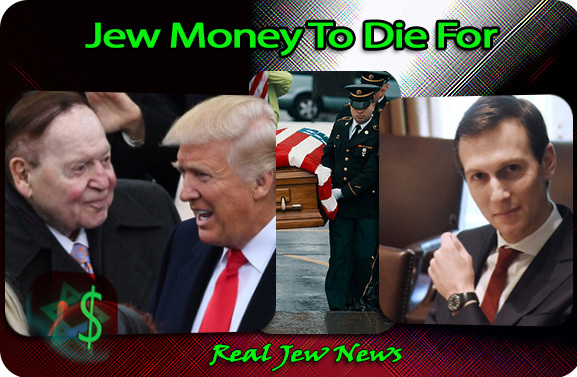 FOR ALL INTENTS and purposes, any US soldiers who have been killed during the illegal invasion and occupation of Syria have DIED FOR ISRAEL, and NOT for America. If we didn’t have the stinking carcass of the albatross of IsraHell around our necks ever since LBJ sacrificed America’s reputation of even-handedness towards the Middle East and North African countries on the altar of Israel-worship marked by his cover-up of Israel’s act of war on the USS Liberty and thoroughly Judaized our foreign policy, just think of all the friends we would’ve had in the region and other parts of the world! Our sad state of affairs has made Israel’s problems OUR problems, and have thrown our soldiers to their deaths to protect a JEWish state ever since Israel’s air-sea attack on our neutral US Navy ship cruising in international waters. It’s a no-brainer. Kushner is Sheldon Adelson’s rat in the West Wing. Who has Israel’s interests as his first priority more than Jared Kushner? That’s a no brainer too since Kushner lives and breathes Zionism complete with his vicious hatred for the trodden-down Palestinians. He’s been buddies with Netanyahu and Israeli leaders ever since he was a kid. Don’t forget, Bibzy slept in little Jared’s bed not too long ago. As long as Kushner is de-facto chief-of-staff, Sheldon will keep Trump’s presidency alive with bucks and buddies with big pockets from his tribe. It’s the Jewish vote that counts, that owns the media, the banks, Wall Street and the FED and DICTATES foreign policy. WHAT’S TRUMP TO DO? Honor his campaign promises to get us the hell out of all these foreign wars? Now Trump’s pleasing the Jews with MORE regime change, this time south of the border in Venezuela in order to counter Jew-hated Russia’s influence there. Everything Jews hate, America has to hate. Everything Jews want destroyed, America sends its goys to wreak the havoc….AND die.